The Harper adjustable bed from Mi Beds part of Furmanac Group that also cosists of Hestia are pleased to offer the Harper Adjustable bed it offers a 1200 pocket unit in the mattress along with polyester fibre and a 5cm layer of Natural latex and offers a medium soft feel , the mattress is further enhanced with a deep micro quilted top cover that has been treated with Adaptive cooling fabric. . The bed is controlled by a classic 6 button corded control and the base is made in a range of fabrics . You can also add a headboard to the bed which will be made in the same fabric . The standard base pictured is 16" high and comes with the option of a drawer in the end of the base if required for £70. 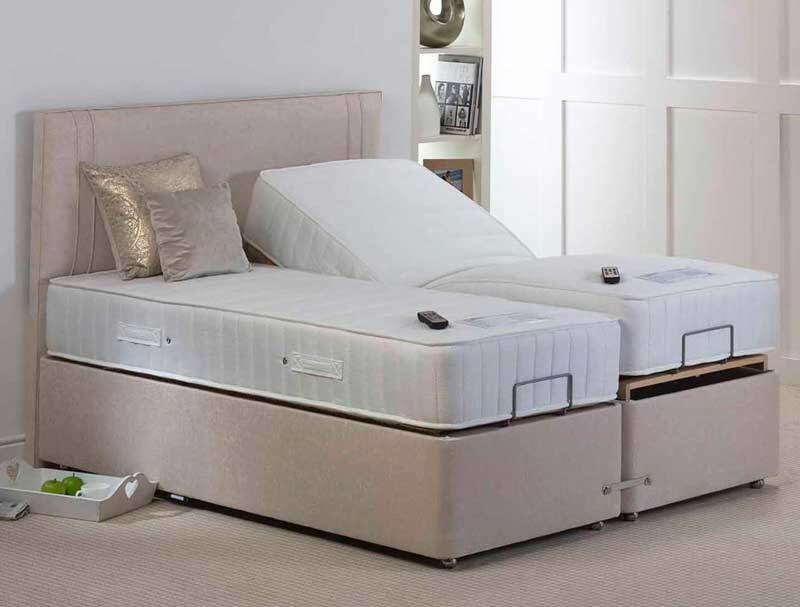 Delivery is to room of choice by Mi beds who will unwrap and assemble for you , please note they will not dismantle your old bed or remove it , as the room of choice must be clear for the bed on the day of delivery. Please note headboard pictured is not included and is not available . VAT Relief - PAY 0% VAT If you have a long-term illness or you're disabled, you won't have to pay VAT when you buy an adjustable bed from us. For VAT purposes, you can claim 0% VAT Relief if you meet any of the following conditions, You have a physical or mental impairment which has a long-term and substantial adverse effect upon your ability to carry out everyday activities. you have a condition that the medical profession treats as a chronic sickness, such as diabetes. Hiatus Hernia or you are terminally ill. To qualify for this we would send you a form that you would fill in and we would present this to Hmrc , which will exempt you from Vat . You don't have to physically buy the goods in person. If your parent, guardian, wife or husband buys the goods for you, then you won't be charged VAT. For more information please call our customer service team on 01379 855456.